The Office of Career & Professional Development has recently launched a new platform, Handshake, to connect students with employers. Handshake boasts an interactive design that allows students to upload their resume and cover letter, create a professional profile and search for job and internship opportunities. Now, it is easier than ever for students to find positions outside of Nashville. 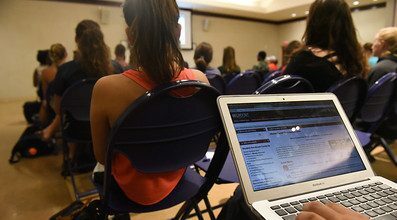 According to Rachel Walden, assistant director of the Office of Career & Professional Development, “employers across the country are connecting with Belmont” because of this platform. Students can access Handshake through the link on MyBelmont. Its interactive design has made Handshake a unique and helpful tool for students and employers. According to Walden, Handshake was “designed with a student in mind.” The interactions students have with the platform and employers are dictated by the student’s profile. This means that opportunities are automatically tailored to students’ interests and areas of study. Another key feature of Handshake is its opportunity for personalization. The platform will automatically import information from a student’s resume into their profile so that they don’t have to enter everything in manually, but the student then has the option to edit, add or remove information from the pre-designed profile. Students also have the opportunity to “favorite” jobs, employers or opportunities that interest them, and Handshake will send notifications about those items. For example, if a student has “favorited” a job notice, Handshake will email them in advance of the deadline to remind them to submit the application. Handshake also provides an important link to the Office of Career & Professional Development. Any resume or cover letter that is uploaded to Handshake will be reviewed by a professional in that office. There is also an option on the platform to schedule an appointment with the office, and students will be given a point of contact within the office so that they know exactly who they are meeting and how to reach out. Because the office serves Belmont students and graduates for life, Handshake is also available to all Belmont alumni. Handshake was created by college students at Michigan Tech in 2014 who were frustrated with their university’s availability to potential employers and recruiters. Their goal is to “democratize opportunity” by leveling the playing field for students across the nation. Handshake currently helps over 8,000,000 students and alumni at over 400 university connect to over 200,000 employers. The Belmont University Career Development Team consists of experienced career professionals who provide a wide variety of services and resources to assist students and alumni throughout the entire career planning process. They offer individualized assistance to students, alumni, faculty and staff, and employers.